Large yields best picked at 2-4"
Apart from producing a delicious, high-quality cucumber perfect for pickling, County Fair Improved Hybrid has another claim to fame: it's the only cucumber around that's resistant to Bacterial Wilt. It's bitter free, producing large yields of cucumbers that are best picked at 2-4". 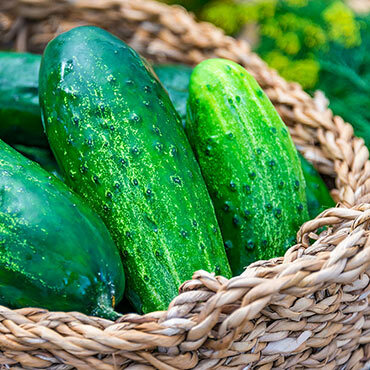 Since these predominantly female-flowering cucumbers don't need pollinators, you can feel comfortable with providing permanent insect barrier coverage like our Surround at Home®Crop Protectant (which will also help protect the plant from days of high heat). In addition, we recommend our Sure-Catch™ Cucumber Beetle Trap to guard against pesky cucumber beetles. 52 days to maturity. Soil Preference: Well-drained, sandy loam soil.